The Game Boy Color was the first foray into portable gaming for many. Its simple, pocketable form and sturdy build made it the perfect entertainment device for kids. Its vast library of games made it the perfect companion for long car rides, birthday parties, a trip to grandmas, or Saturday mornings lounging on the couch. It was a major step up from its predecessors, the Game Boy and Game Boy Pocket, boasting improved processing speed and a glorious color display. However, the lack of a lit screen meant playing at night was a hassle, requiring you to sit directly under a light source or utilize one of the many available accessories, such as the infamous "worm light". With back-lit screens coming standard with all modern portables, this first-world problem is a thing of the past, but there's something special about going back and playing the old classics. Sure, many can be downloaded on the 3DS virtual console or emulated on one of the many obscure handhelds being produced, but it just doesn't feel quite the same. And while the Game Boy Advance SP is wonderfully designed, there's no denying how great a Game Boy Color feels in the hands, not to mention the nostalgia it brings. There were many copycats clambering to cash in on Nintendo's success, releasing all manner of knockoffs, many of which were nothing more than simple one-game machines with a shell made to resemble a Game Boy. However, there were a handful of respectable clones that played the original software, and a Chinese company by the name of Kong Feng were one such producer, cloning the Game Boy Pocket (GB Boy) and then the Game By Color (GB Boy Colour). They later came out with a GBA SP model, but it's just the GB Boy Colour with a different shell. The GB Boy Colour, in addition to playing original Game Boy and Game Boy Color cartridges, supports multiplayer via link-cable, has a headphone jack, and can be powered via AC adapter. It does have an infrared lens, but there don't appear to be any infrared LEDs inside. Physically, it's practically identical to the real thing, though it is slightly bigger, and has a rectangular screen which distorts the graphics ever so slightly. The buttons don't quite live up to Nintendo standards, but clones never do. They're less mushy and more firm (which makes quickly rocking the D-Pad a little more difficult), but they're not terrible by any means and are quite comfortable. Unlike a lot of knockoff handhelds, this one is surprisingly well built. It's got some weight to it and doesn't feel like it'll crumble under the force of your thumbs. The battery life is excellent, giving enough playtime even on store-brand batteries to play through the majority of Link's Awakening, and the speaker is significantly louder than that on the original GBC. When they're almost out of juice, the system will repeatedly reset to the boot screen. Aside from the back-lit screen, the biggest reason to hunt one of these units down is for the built-in games. The box touts a whopping 188 titles, but it's really 66 listed three times each. Unfortunately, not every GB Boy Colour out there comes with these on-board games for one reason or another, so make sure you know what you're buying if you do decide to pick one up. This handheld was produced in blue, green, yellow, crystal blue, crystal purple, and crystal green. Whether you're a handheld enthusiast looking for the next cool toy for your collection or just want to experience those classic games from your childhood a second time around, the GB Boy Colour is well worth owning. Hey, just stumbled upon this, because I received my gb boy colour today. How can I access the build in games (didn't even know, there were any)? If I turn the gb boy on without a cardridge in it, it just shows the logo screen and nothing more happens . This little fellow is in deed worth his money, totally glad I managed to get one. That would be how you access the games if it had them, so your unit must not. I don't think the ones with on-board games are made anymore. I'm not even sure if the ones without are still manufactured, but they had a sticker dated 2013 on them. Not sure if that's a manufacturing date or when they inspected the unit to make sure it still works. If its any consolation, the ones with built-in games are said not to be able to play larger games like Pokemon. Either way, definitely a cool unit to have. I think I'll eventually end up picking up a multicart for mine. Are there games like Mario, Zelda, Megaman, etc? It seems they've recently started producing the models with built-in games again. From the images I've seen, there are Pokemon, Zelda, and mario yes. The first GB Boy Colour I bought seemed to develop a problem with dpad down and a single bad pixel (can only see it on black screens) the second one I bought is perfect. Yes it's another 27 bucks, but still cheaper than a few rounds with the boys on a Friday night, and good clean fun to boot! I managed to fix the first one by replacing the rubber contacts part beneath the dpad with one from a GBA replacement kit I bought for another project. Using one from a GBA you have to manually align the rubber part with the dpad as the alignment holes in the rubber don't match, but the GBA dpad has a raised center making it fit a little tighter. Dpad performance is so much better now that I may swap out the one on my second GB Boy Colour. I was impressed by the fix. It feels and plays great. I used a vertical scrolling shooter as a test and experienced a night and day difference in dpad performance and feel. Your mileage may vary of course but I wanted to share this in case it may help...someone get a little more out of their GB Boy Colour investment. So I have one perfect one that pretty much stays in the box, and the repaired one that I combined with a cheap 108 game multicart (yeah, clone on clone action) for a good selection of games and an inexpensive but good playing piece I can throw in my bag for daily use. i ordered mine still have to receive it, the reviews i read so far is great for a $25 handheld clone so i am confident that it will live up to my expectations. 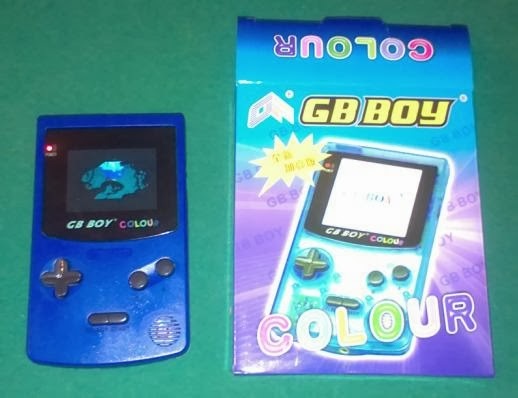 Hey where could i purchase a gb boy color? I have a gb boy colour with the built in games and yes, it can play Pokémon. Just be careful not to rush the title screen too fast. Wait for the intro to end, then press the continue button. Wait a few seconds then press the save file button. Then wait a few more seconds and press the save file and you are good to go. I did not know the 66 in 1 versions were rare because I received yesterday on January 22nd in 2017. Also people say the buttons are cheap feeling on the contrary. I believe they are actually pretty good and are easy to press. However the d-pad is not as good as the original. Also I would say the aspect ratio makes little to no difference when playing most games. I hope this comment helps! A. I realize I made tow grammar errors sorry. So you can play other gb and gbc cartridges with this?